It seems that the Verizon didn't included its SIM CARD by default. You had to remove the back cover of the Stratosphere 2 casing then find the SIM card slot and insert it the Verizon 4G LTE SIM Card to the slot. Hold your Stratosphere 2 with your left hand, facing it upward and make sure that the Rear Camera is on the top position from your eyes. There is an opening cave on the top-middle side of the SCH I415 that you can use as starting point on opening the rear cover of the phone. Insert your right forefinger or middle finger on the opening gap, pull it up until top side of the cover-casing is detached. Continue to the bottom part of the cover until the cover is fully removed. 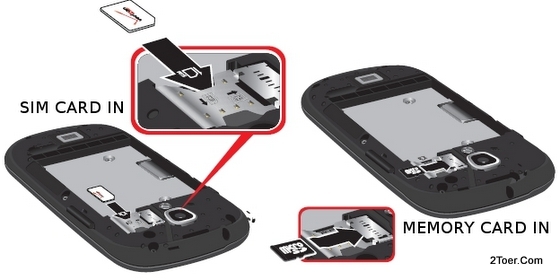 The SIM Card Slot (Holder) is located on the right side of 5MP rear camera (along with microSD Memory card slot. See the image above) Of course you only be able to see the SIM slot if you already opened the back cover casing of the Stratosphere 2 (two). With the gold-contacts of the SIM facing downward (also means the Verizon logo facing upward), end the cut-edge of the SIM is align to the mouth of the slot, just insert and slide the card into the card slot. In case you wanna remove the Verizon SIM Card, you just need to slide the SIM out from the slot. If there is problem on removing the SIM, you can use your fingernail to slide it out from the slot. Now Move to the next tutorial. There is only 8GB internal memory available on this phone. If it's reduced with preloaded applications and also OS memory, it might be only 6GB user memory available for this Samsung Galaxy Stratosphere II SCH-I415. But don't worry, there is an external microSD card slot is ready for you. It's up to 32GB memory which can be handled. Inserting microSD Memory Card is simple. As we mentioned on the picture above that the location of the Memory card slot is beside the SIM card slot and Camera, you can try to insert the card diagonally across the SIM card slot. Just make suer the microSD label is upward or the gold-contact connector facing downward the align the card with the slot, and start to slide it in until the card is locked. Done. Just like as usual, if you wanna remove the microSD card Memory, you need to unmount it from Settings > Starage > Unmount SD card option before you physically remove the card. It should be done to prevent any error or failure on the card and data. Then push the card first to make it unlocked and slightly pop out, then grip with your finger to pull it out or slide it out. Done. After you finished on the SIM and microSD Card, now it's time to assemble the battery of the phone. It's needed because defaultly the Li-ion 1800mAH battery (replaceable and removable) isn't attached yet to the compartment of the battery. Just make sure the Samsung label facing up, make sure the connector of the battery and the compartment is aligned, then slide and press it. Attach back the battery cover is the finalization of all basic process on this phone before you can safely charge the battery and turn on the phone. Align the cover with the body, make sure that the camera hole on the battery is fitted properly with the rear camera, then press it down all the edges of the cover and body until it clicked (you hear sound like "clack cleck" or something like that). It there is no gab between the cover and body (smoothly attached), it means you had done the job on covering on the phone. Done. Go to Home Screen > Touch Apps > Settings (or Menu > Settings) > Back up and reset > Factory data Reset > Reset phone > Erase everything. Because this steps somehow is dangerous, you could protect anyone who don't own this phone on doing this Factory Reset by using PIN or Pattern Lock. Whenever the PIN protection or Password Protection is activated, whenever someone try to reset your phone, it would be prompted with password lock or PIN.